The best beaches of the Florida Keys are also one of the most unique beach travel destinations in the United States. They are colorful and quirky, tropical and welcoming. The Florida Keys will leave a lasting imprint on you when you visit. Here, life revolves around fishing, boating, scuba diving, eating, and drinking beer. There are few beaches on these dry rocky islands and most beaches are just a few feet wide at low tide and the water is just a foot or two deep for about a thousand yards out. The Florida Keys beaches are on the Atlantic Ocean side of the islands. The shores of the Gulf side are mostly rocky and more suited to fishing and boating. 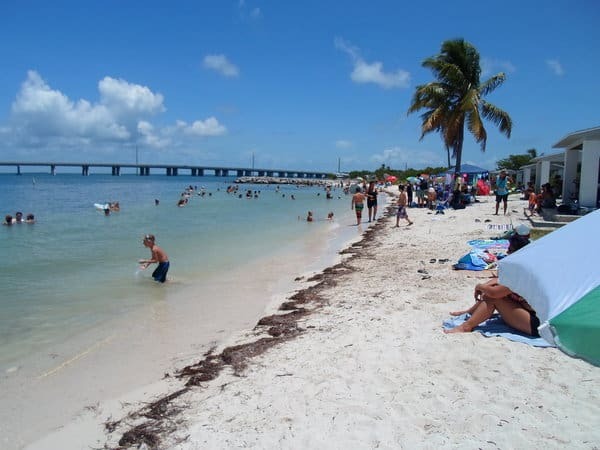 Come to the Keys for a great beach vacation! 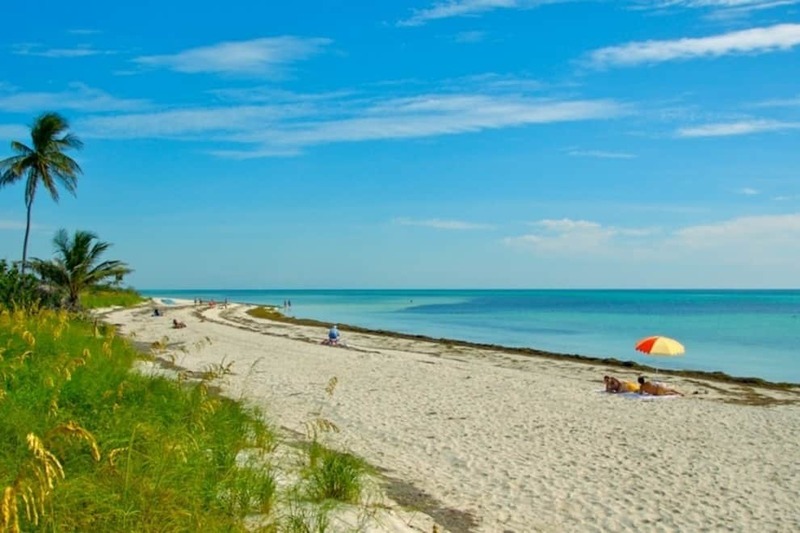 Enjoy a great vacation at some of the best beaches of Florida! Cannon Beach is located near the John Pennekamp Visitors Center,and gets its name from cannon placed at the Pennekamp Park entrance along with the cannon on it’s beach. 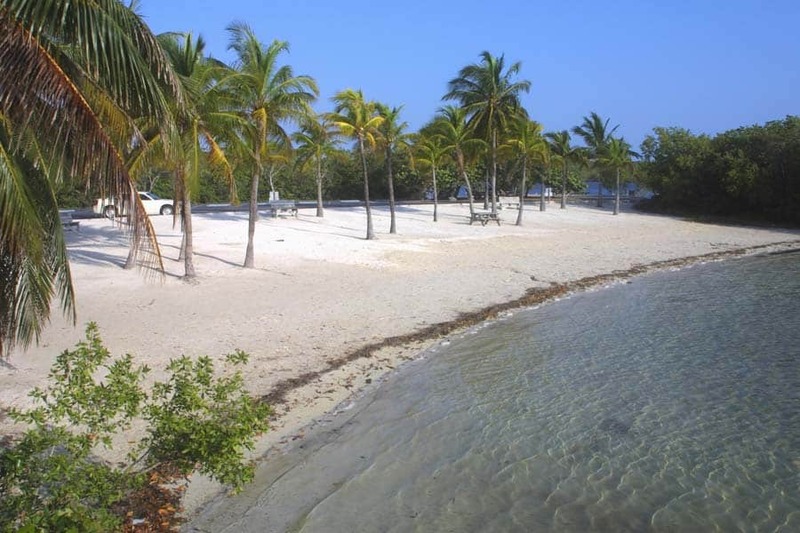 This beach is small in size, but is still quite a lovely man made Key Largo beach with its white coral sand. You will be able to see the 17th century shipwreck replica about 100 feet from shore. Snorkeling is also very popular here, and you can snorkel or swim in the lagoon. The waters are very calm here and Cannon Beach is great for small children who will be able to enjoy the day, wading and playing. 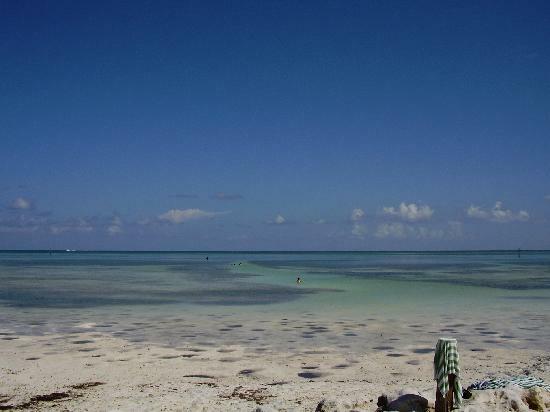 You will want to spend time at Cannon Beach in Key Largo. Visit our Key Largo Vacation Guide. Far Beach is great for swimming and relaxing under palm trees with more shade than Cannon Beach .Far Beach is a place to go and unwind, take a dip in the ocean, and then spend the day lounging in the sun. It is a beautiful setting with its coconut palms and sea grape bushes. This palm-lined, man-made sandy beach attracts sunbathers and beachcombers. The water is calm, warm and shallow, making it a good swimming spot, especially for children. A portable rollout mat called the Mobi-Mat is installed across the sand, providing wheelchair accessibility. Visit our Key Largo Vacation Guide. The first undersea park in the U.S., John Pennekamp Coral Reef State Park encompasses approximately 70 nautical square miles. While the mangrove swamps and tropical hammocks in the park’s upland areas offer visitors a unique experience, it is the coral reefs and their associated marine life that bring most visitors to the park. Many enjoy the view of the reef from a glass-bottom boat tour, but visitors can get a closer look by scuba diving or snorkeling. Canoeing and kayaking through the park’s waters are popular activities; fishing is permitted in designated areas. Visitors can enjoy walking on short trails, picnicking, or swimming at the beach. The Visitor Center has a 30,000-gallon saltwater aquarium and nature videos are shown in its theater. Full-facility and Youth/Group campsites are available. Beach wheelchairs are available without cost. Free 24 hour WI-FI at Concession Building and Dive Shop Building. Visit our Key Largo Vacation Guide. Anne’s beach is a great place to stop and relax, or have a picnic on your way up or down the Keys. The beach is narrow and hard-packed and the water too shallow for swimming. It’s a good spot for sailboarding or kitesurfing, launching a kayak, birding, or for just having a stroll along the boardwalk. There are public restrooms and a shower to wash off the sand. Pets are allowed but must be on a leash. There are two entrance ramps to the beach and two small sandy parking areas. Visit our Islamorada Vacation Guide. 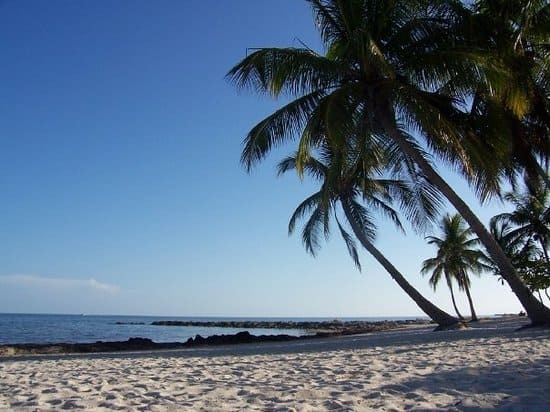 Islamorada Library Beach, is an unusual beach hidden right behind the Islamorada Library (81.5) across from the Monument to the victims of the 1935 Hurricane. 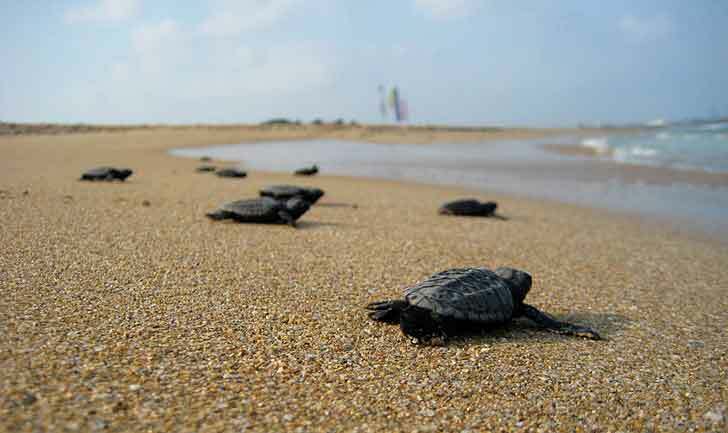 Its not a surprise that this is mostly only known to the locals, as the beach is tiny. Made up of a beach (which is no more than 30 feet across), and a park featuring a small playground with swings, this would be a nice place to bring the little kiddies. It does offer restrooms. Visit our Islamorada Vacation Guide. 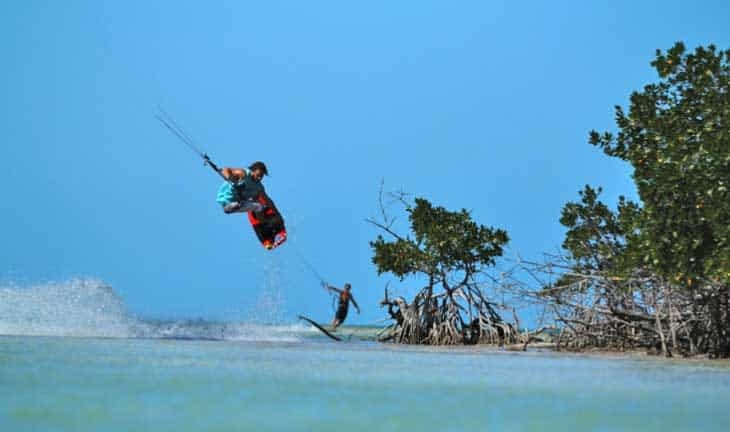 Kite Beach is on the island of Islamorada, which has been a favorite place for kiteboarding for years. Hidden behind Whale Harbor Marina, experienced kite boarders will be able to use this point to launch their kites and then be dragged across the waves. Please note that there is a charge for using Kite Beach, so check in at the marina dock before starting off. Visit our Islamorada Vacation Guide. 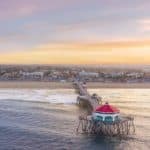 Beautiful photos and so many great beach destinations. This would indeed be a great vacation hitting them all up. Gonna have to start planning. Thanks so much for doing all the hard work for us. 😉 Wonderful Site. I always love going to your site. it is so warm and inviting. I know I always say that. it is just well you are a cool mom. So how is business going anyway. It has been a while since I have said hello. You have a lot of new sights to see. which is your favorite? Hands down my favorite is St Pete Beach in Florida. I love the atmosphere, the people, the places to eat and drink, everything about it actually. So much that I will be moving there this winter 🙂 Business is great actually. I am glad you came back for a visit. How is it going for you? I think I originally commented directly onto your site without going through here first, oops. But, as I mentioned on your site before, you have some really great info here! My girlfriend and I are planning a trip to Florida in February this is definitely gonna help. We pretty much had the basics down but I love how you added complementary information to your articles. Good stuff! Thanks! Keep it coming! I will keep it coming Danny! Where are you going in Florida? They probably have the most coast line, so I will be spending a lot of time on Florida beaches for a while…. Thanks for visiting! 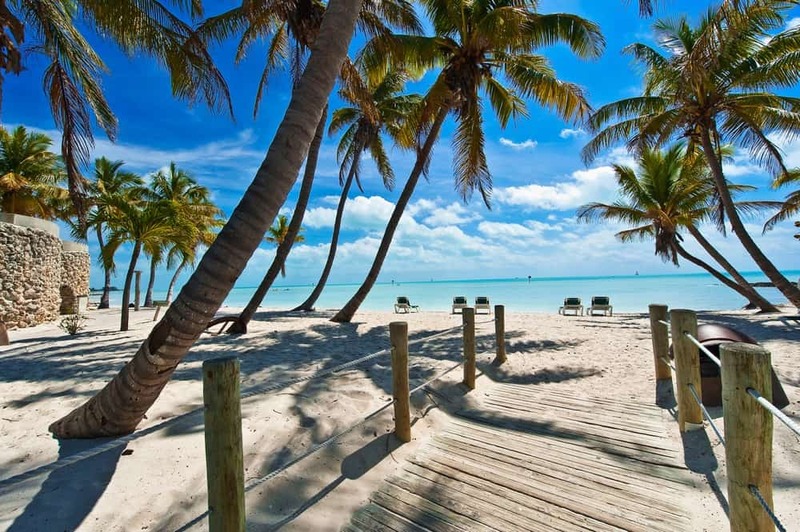 I do need a vacation… Key Largo Vacations looks sweet! 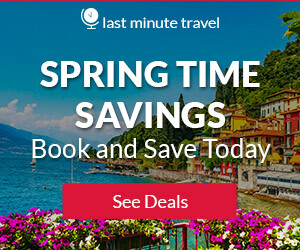 When are the best times to visit? Spring break would probably be to crazy… Is there and IHOP close by? Lol jk. Should I know Spanish or can I get by with my high school knowledge? Looks like Im going to Mexico. No, this is part of the Florida Keys and you do not need to know Spanish! LOL May thru October is going to have ideal weather. Anytime will not be cold, but the water will be a little chilly outside these months. Thanks for visiting the best beaches of Florida Mike! This is a very extensive list, and very informative! It’s obvious a lot of research was behind this. I love how the description for each beach was short and to the point. Even though there were so many beaches to read, I didn’t feel overwhelmed at all. I just wanted to keep on reading. I’ll be sure to bookmark this page as I will want to read it again the next time I visit Florida for an excellent recommendation. Thank you Joeka! Yes, the post would have been too long if I had done a longer description for each beach. I do plan on updating it with a little more tho 🙂 Thank you for visiting Key Largo! 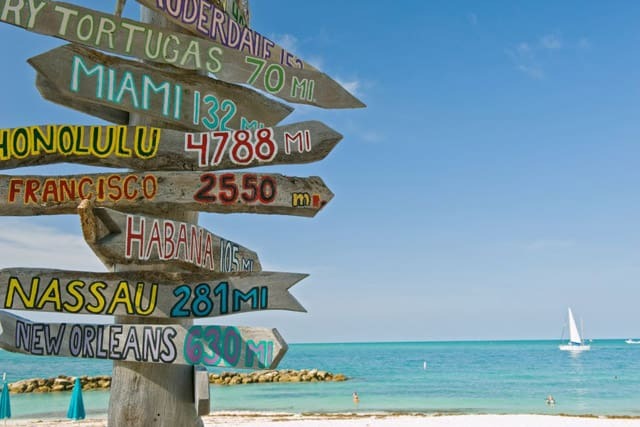 After reading your article, I am now interested in visiting one of these beaches in the Florida Keys. I have always thought that tropical areas make ideal vacation spots and they are good for relaxing. You described the shores of the Gulf side to be mostly rocky and more suited to fishing and boating. I have heard that tropical areas are usually warm and humid. 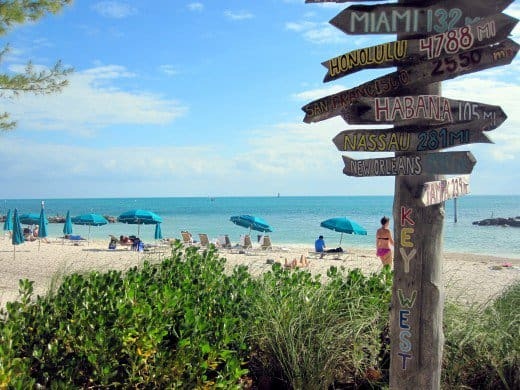 Looking at the best beaches of the Florida Keys – what is the general weather like? The average temperature is 77.8Â°F, with the average low temperature being 73.2Â°F. Perfect! I’m a huge Jimmy Buffett fan, and being a parrot head, I have always had such a desire to go to the keys. Oddly, I lived in Southern Florida for 5 years, but never made it down to the keys. One of my biggest regrets from my time down there. 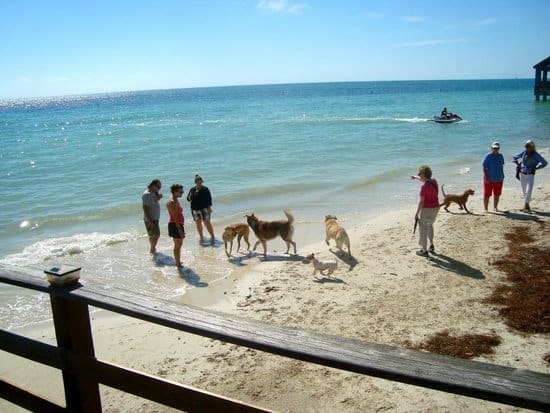 I absolutely love the concept of Key West Dog beach. I take my dog everywhere with me, so he would love the having his own “spot” on the beach. Plus having pet-friendly Louie’s Backyard next door sounds like a wonderful combination. We were trying to think of where we wanted to vacation this summer. I think I may have to start campaigning for the Keys! Oh you should, I know you will love it. It is an experience everyone should do! I’m engaged and we’re thinking of having the honey moon at Disney World. I’m thinking that maybe traveling to coast and visiting some of the beaches wouldn’t be a bad idea, though. Higgs Beach definitely catches my attention. I love idea of going to a beach that has a laid back feel as you’ve described. You’re welcome and you will both love it there! Hello here, thanks for reminding me how great can be these beaches of the Florida. Last year, I visited my friends who live in Mississippi, pretty close to Biloxi. With them, I visited few more states such as Alabama, Louisiana and Florida. I never have been in Florida, but when I saw the Pensacola Beach , I was astonished how everything is beautiful and gorgeous. I was at the end of October. The water was green as emerald and so clear as crystal. The sand soft and white. I felt as I am in heaven, really. I think that your mentioned beaches in the Florida Keys are better and more appealing. Anyway, I promised myself that I will be back to Florida as soon as possible. I was few times in California and on the East coast. It is different and plain sight compare with your described places. Thanks for the information, all the best, happy writing, Nemira. Never had a keen interest in visiting Florida before. However lately I’ve really have a desire to explore the whole United States (from end to end), including Florida. Month visiting the Florida Keys and explain the different islands. You do have an excellent review of what to look for. Thanks! I have never been to the east coast and this makes me want to go more then ever now. I think it would be fun to go to the Dry Tortugas National Park. I don’t mind long boat rides and I would love the way less crowded. So many options! That’s great! How many time do you think it would take me to see all these beaches? I’m planning a holiday and would like to know if I’d be able to do it. This is such a useful list! These beaches sound so amazing. If i ever go to Florida keys, I now have a list of places to go :). Smather’s beach sounds particular interest. Thanks for sharing this! 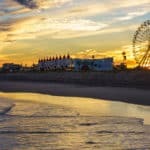 Really nice list of beaches to visit. Really nice to see so much details you have included for each location, I’ll bookmark this and use this as my beach guide for my next visit to that area for sure! Absolutely great looking site!Packed full of just the options and information I need to escape a dreary Canadian winter. Cheers! -in-law lives in Palm Beach and when we go there I never want to come back home. I never heard of Sandspur Beach, it looks like a nice place. I may have to look it up next time we go down. Wow! 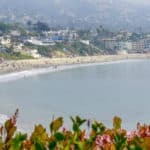 what a great list of beaches I feel like I am already there with the descriptions and pictures, thanks for sharing. I am in Texas and have not been to the keys. What would you suggest for a romantic trip to keys for me and my darling? Wow, your girl is a lucky lady 🙂 I think that the two of you would have a really nice time staying in a cottage on St. Pete Beach. Thank you for your comments Stephen.